that is quickly becoming a Seattle icon. 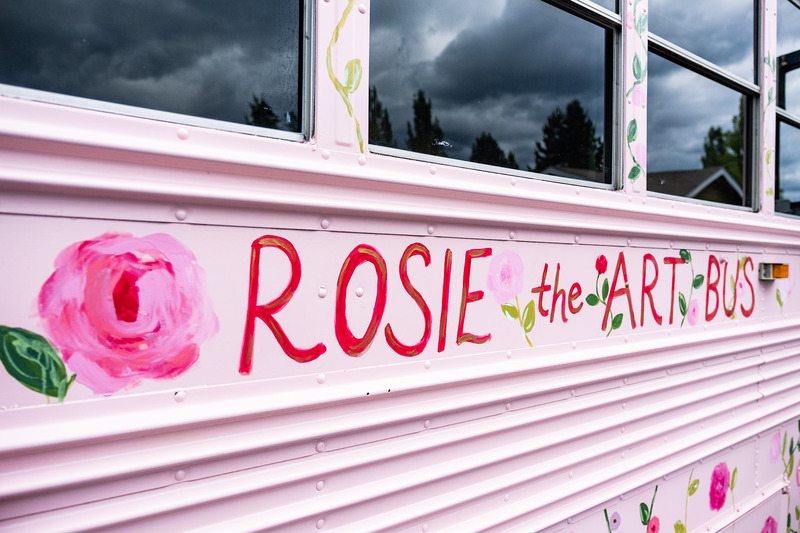 Spend the day with Rosie and me on an “Artful Adventure.” Details here. I also offer tours and group activities for private parties and businesses. 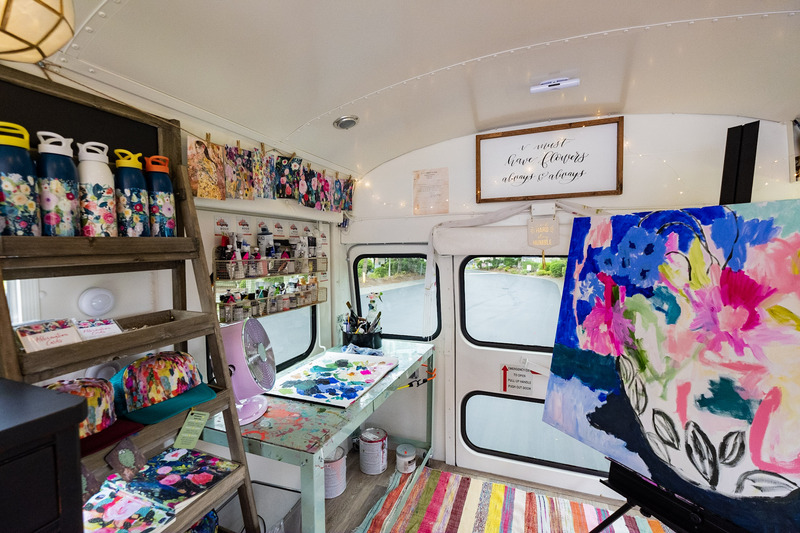 In March 2017, I converted a 2002 Bluebird short school bus into a mobile art studio and traveling storefront dubbed “Rosie the Art Bus.” I paint inside the bus and on top of the rooftop deck and invite local musicians to join me up there to celebrate and share the arts. 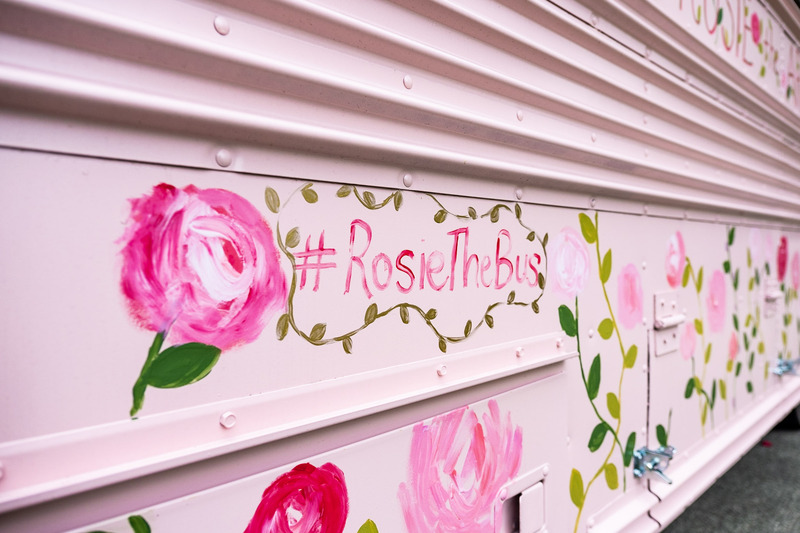 I hope Rosie the Bus brings art visibility to the community to share the creative process and a glimpse at the arts as a profession. 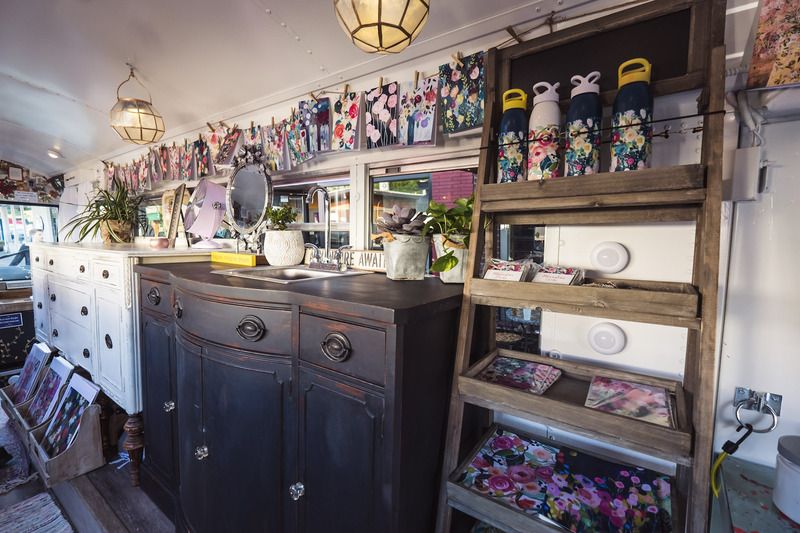 WHY DID YOU CHOOSE A MOBILE ART STUDIO? 1) I want people to see that artists do still exist, that we live here, and we are part of the community. I also want to share the live creative process with people because it is fascinating and inspiring. 2) I could not find an affordable studio space on the eastside of Seattle. 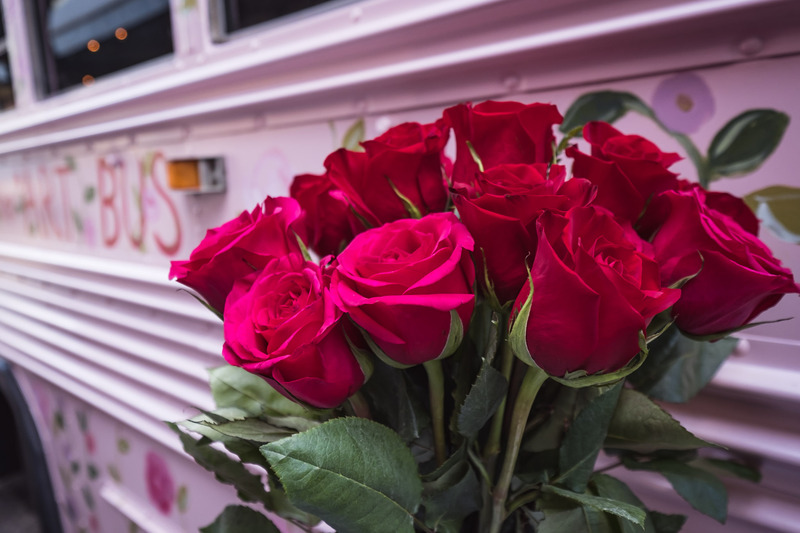 WHAT’S THE STORY BEHIND ROSIE? Like so many blessings in my life, Rosie came only after something else did not work out. I’m grateful for the heartache that led me to Rosie, which is even better than I could have imagined in my wildest dreams. She is also part of the ending of my upcoming memoir, A Year of Roses, and represents my long sought freedom and independence. IS ROSIE DIFFICULT TO DRIVE? 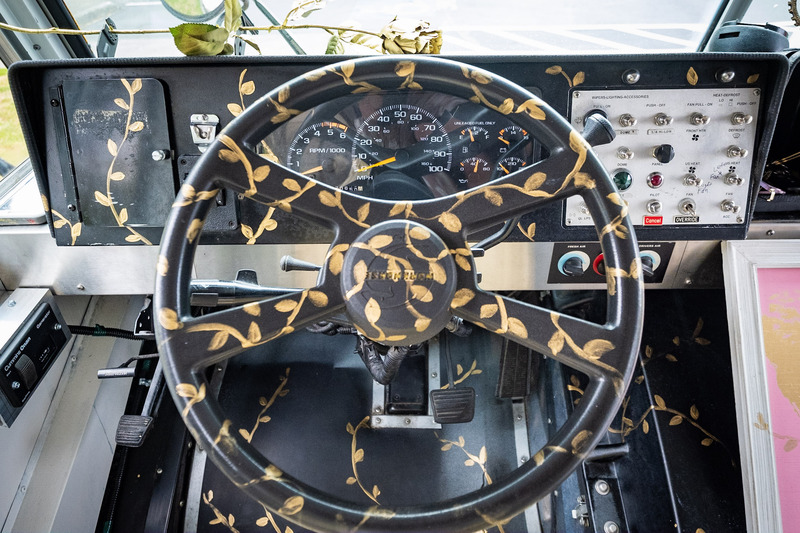 No, Rosie is so much fun to drive! 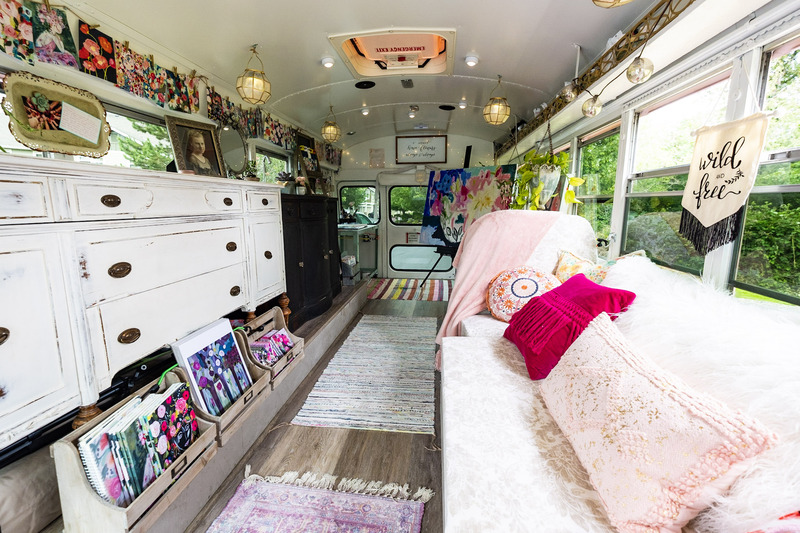 The windows and mirrors make it easy to navigate. She’s such a joy, and I LOVE seeing people’s reactions to her. 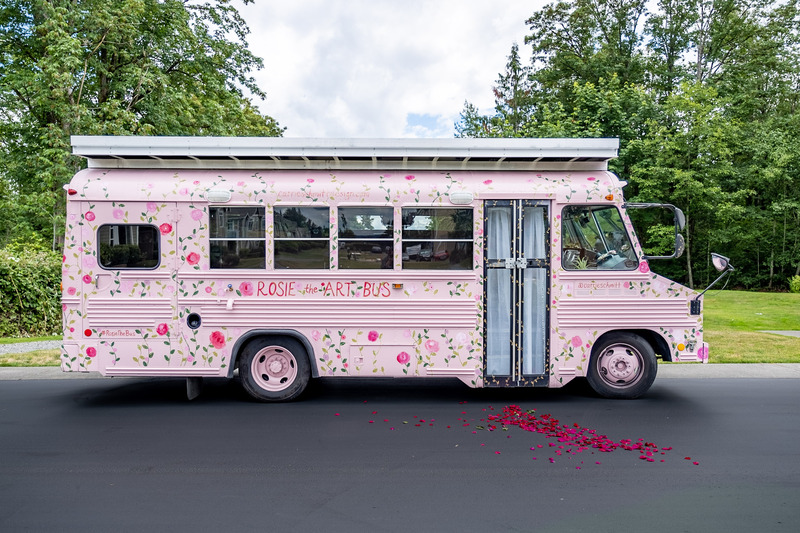 HOW CAN I TAKE A TOUR OF ROSIE? 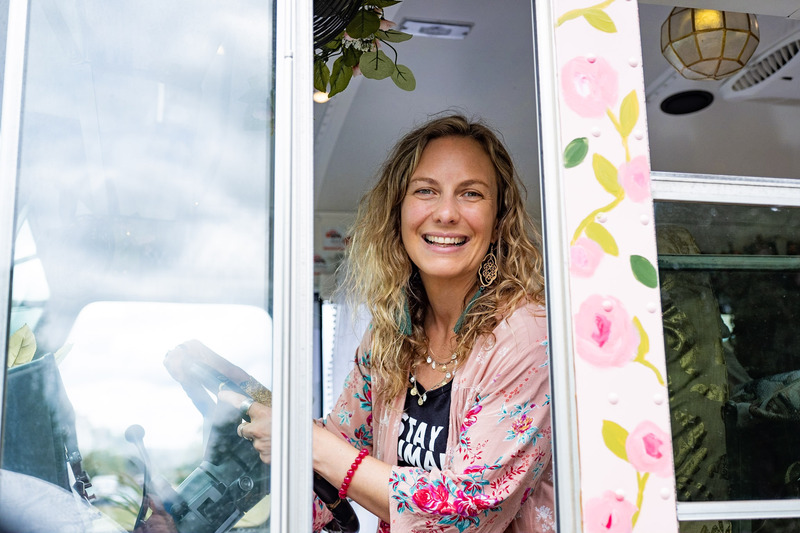 – Check out Rosie’s tour schedule here. 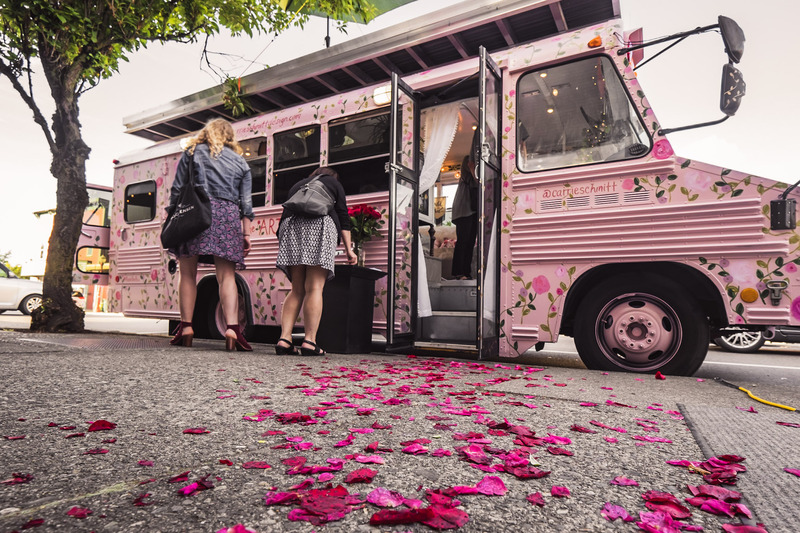 – Sign up for “An Artful Adventure” and spend the day painting with me and cruising around in Rosie. 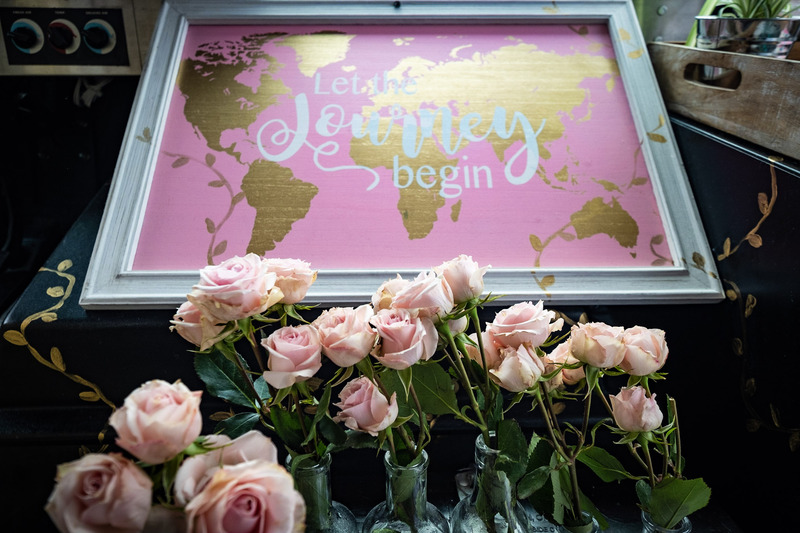 – Follow me and Rosie on Instagram @carrieschmitt for the most current updates on our whereabouts and events. 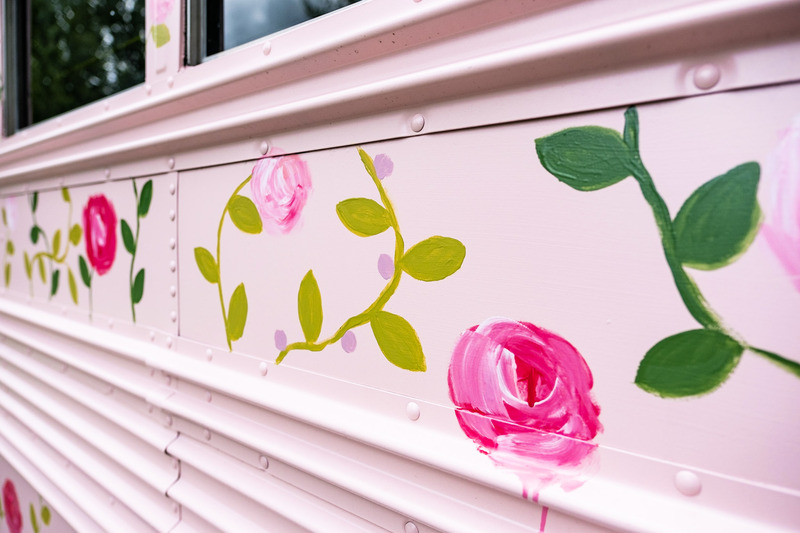 WHAT KIND OF PAINT DID YOU USE FOR THE OUTSIDE OF ROSIE? 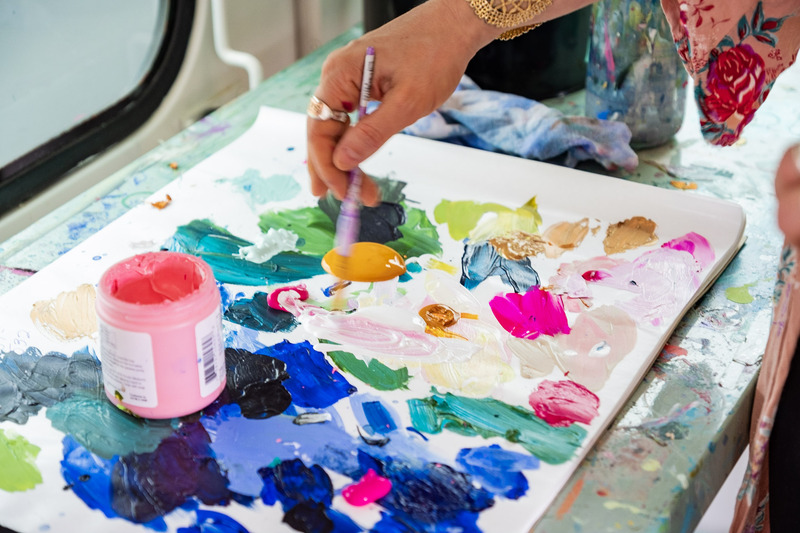 JOIN ROSIE + ME FOR A UNIQUE PRIVATE PAINTING SESSION AND A FULL DAY OF INSPIRATION AND ADVENTURE. 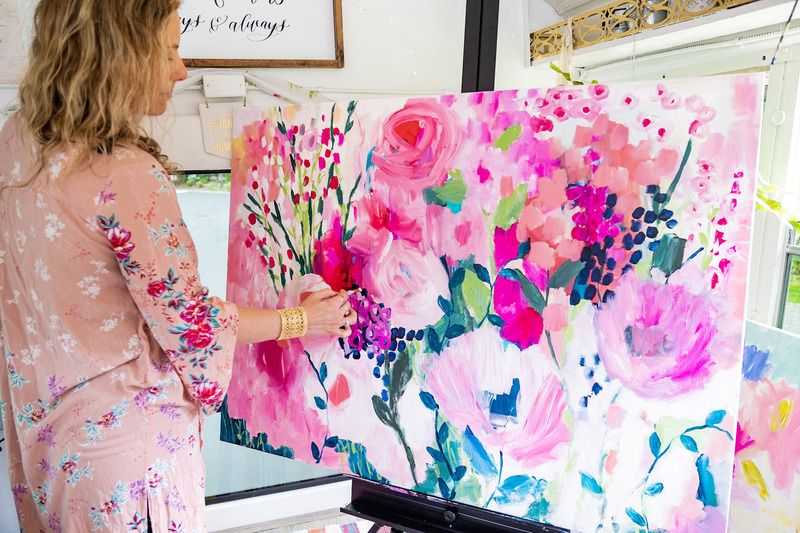 Enjoy a private painting session on the bus with me. 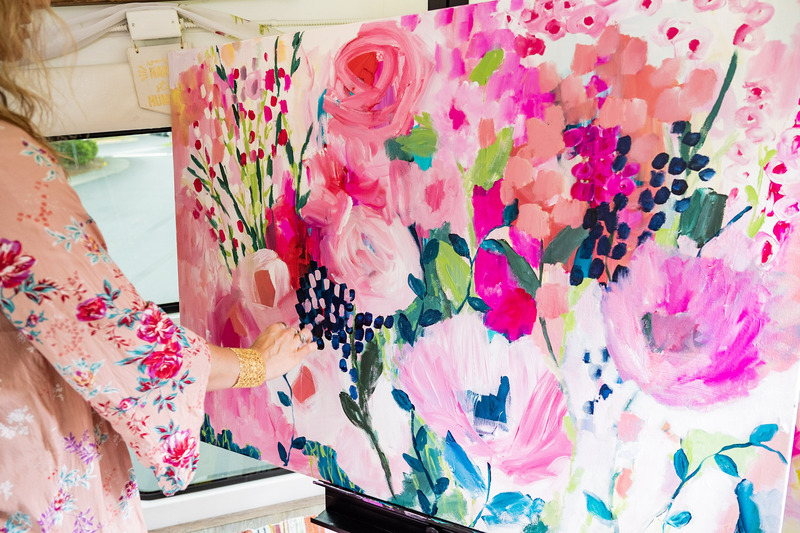 I will share how I create a painting from start to finish as we paint side by side. 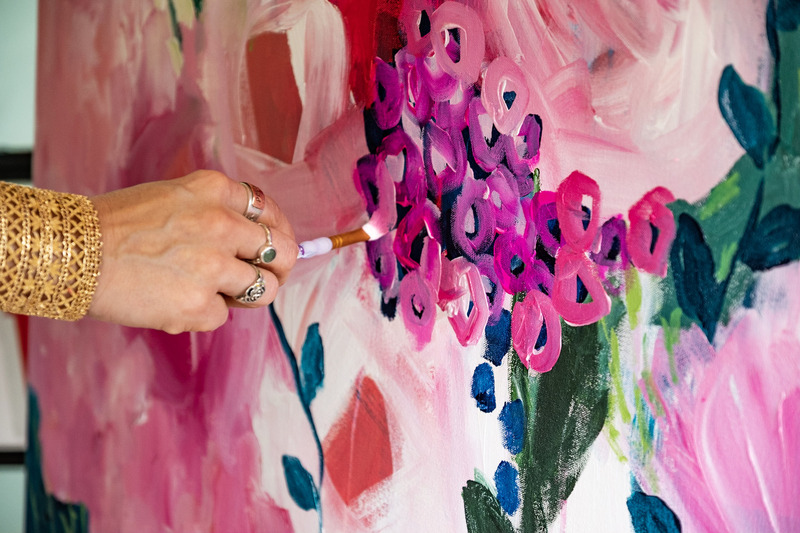 Creating a collaborative painting for you to keep is also an option. Benefit from simple techniques I use to spark my creative flow and nurture my mind, body and spirit. 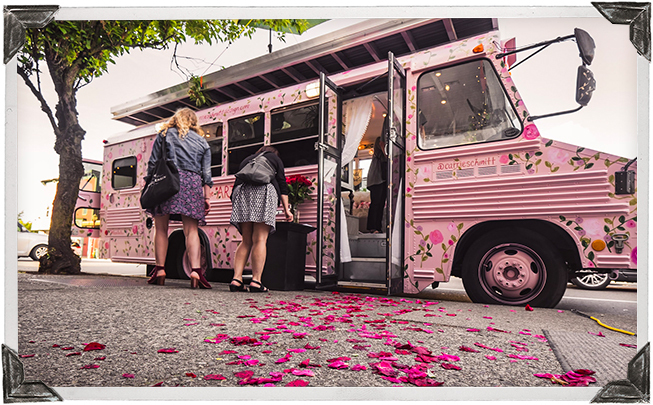 Eat lunch with me at a park or charming café in Seattle or the surrounding area. Ask me questions about anything related to art, such as the creative process, licensing, publishing books, submitting magazine articles, designing products, how to sell in galleries or online, and more! Ask away. Receive two 24x24 canvases for you to work on and all paint supplies. Find joy in people smiling and waving at Rosie and us! Treasure photos from our special day together. Note: Lunch and snacks are not included. Pack snacks and feel free to bring your favorite art supplies if you would like.